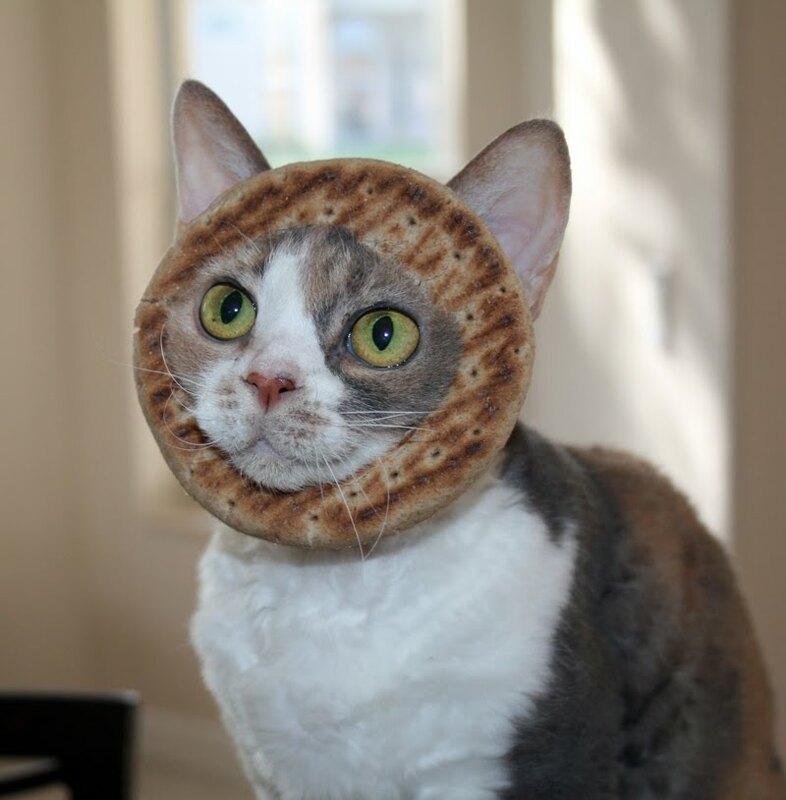 Daisy the Curly Cat: I'm a PITA! Remember last week when Harley got to be In-bread? Well, guess what? My Mommeh says I can be a PITA! That's even better than being in-bread. I think this shows why I am such a good model. The reason I can model so well is because when there are treats around, I tune out everything else. I don't even notice I am wearing bread or pay any attention to it because I am so excited about the treats! Hey, this one looks like a fancy hairdo! I hate to say this Daisy, but that actually looks good on you! Daisy sweetie, whatta pwetty peeta u is! I bets u can makes eben a ol bun look dorables! pa pa pa pita face pa pa pita face..
Hahahaha, you are carbiliscious Miss D.
You look so so adorable, Daisy! Hmmm..., PITA- People for the Insane Treatment of Animals! Just kidding. You make a great little sandwich! But I think your version is so cute !!!!! But beware of the human, You can be eaten ! You ARE a good model Daisy. We have always known you were a good model Daisy and you even look good in PITA bread. That is too cute. Hope you have a really fun day with lots of treats Daisy. Daisy darling, I am in awe. I can't get Gracie to be still for one quick regular shot... and she's not even wearing a hat or bread or a fancy tutu! nah, you're not a PITA... LOL @ Grey Poupon! that made me laff and laff. Oh Daisy! You make a really good pita! How can you look so cute wearing nothing but a pita!!!! Daisy, I believe you'd look cute in anything you wore! You look good enough to eat!! Hahaha! You are one cute Bread Head! Oh my gosh Daisy you are an adorable pita!!! kinda makes you look a little amish. She calls Aswell a PITA sometimes but he do not had any bread around he's head! 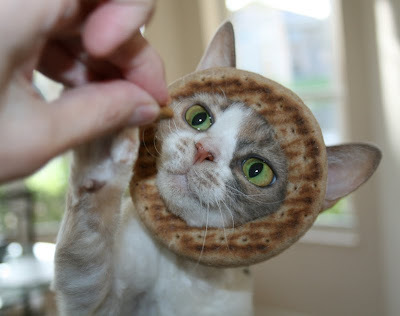 You looks very pretty even with that silly pita hat! Just found your blog via a link and had to see what a curly cat looked like. Daisy you are the sweetest, funniest cat I think I have seen. I love your new hat, it reminds me of the beautiful pieces that Ladies wore in the middleages. You could have been Henry VIII's cat. Daisy there is a piece of pita suspiciously missing in that last pic...did you have anything to do with that?! Me thinks that is a ham pita! PS Yous looks good in everything! You look good in bread! Daisy you are the best looking pita we have every seen! Some of us could munch on that bread! Happy Thursday to you and Harley! Daisy, your Mom is a little...erm...strange. 'Specially with puns! We say to her "Don't EVAR change!" Oh my goodness! Miss Daisy, treats or no treats, you must be the most patient cat EVER! Daisy, we thought at first it was PhotoShopped! LOL. You actually were wearing a cut-out pita bread? That's hilarious! 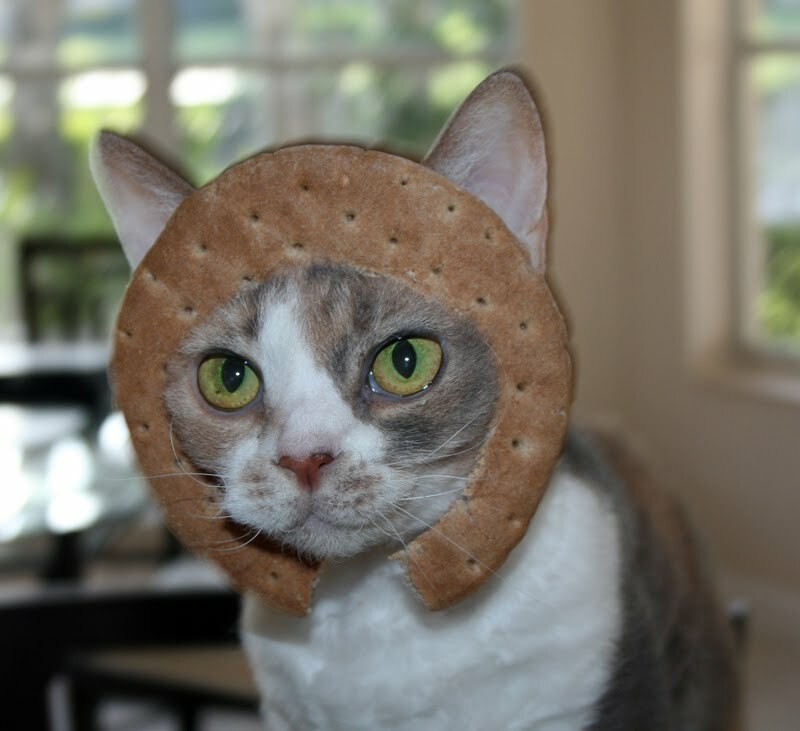 BTW, you might be wearing pita, but you're not really *a* pita (pain in the a@@). LOL. An edible hat. This is practical and cute. How very inventive of your mama, Daisy...We think the new hairdo looks like a pageboy style, very chic, hahameow! Daisy, you really look "pita" good in that bonnet! Daisy, you make a perfect pita!!! 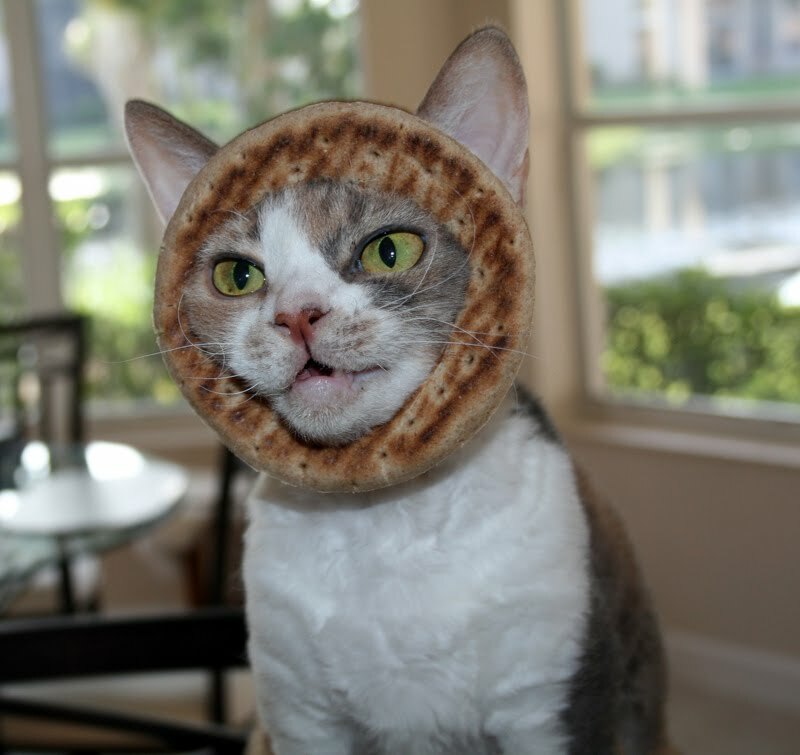 We don't know how you can keep a straight face when you have pita around your head :) You do make a great model. You are very well behaved. Does the treat thing work at the V E T? Daisy, you make that Pita look cute! You are a fabulous model! Sometimes our big sisfur Sadie thinks we're a PITA but we think it stands for something else. Daisy, even pita looks good on you! Sorry Daisy, but you´re a cute PITA!!!! Miss Daisy, We believe you would look good iin any headdress, but the PITA suits you very well! Odd thing about the last photo - you reminded QM of a Catholic Nun who taught her in 2nd grade, Sr. Thomasina...only her head dress was not edible, and was starched white...mixed memories of those days for Our QM! I'm sorry Daisy but your Mom is hilarious! what fun you and your Memmeh are! I am smiling because you are simply adorable. my favorite kitty ever!